There’s a melancholic tragedy to the French Revolution. What began as a noble uprising against a feudal society that oppressed the weak to feed the rich became corrupted and totalitarian within the space of a mere decade. Its perverted sense of justice for The People — not helped by its morally controversial leaders — brought a culture of fear and terror to France, allowing its people to welcome a military dictatorship with open arms. 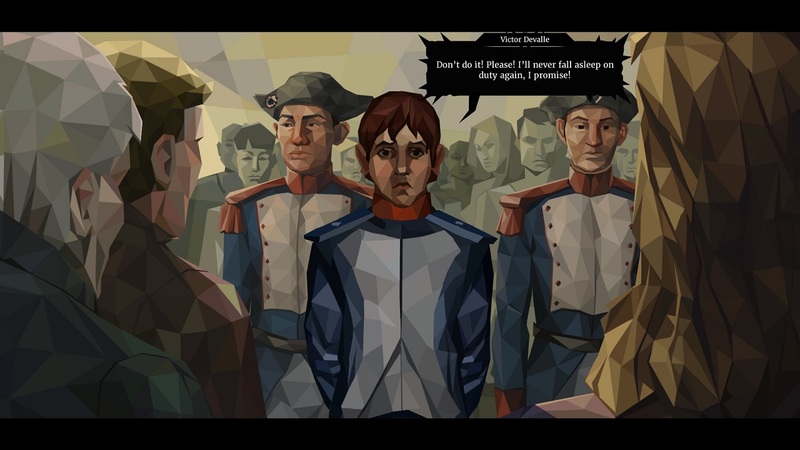 All of modern European history revolves around the French Revolution and its aftermath, so why are there so few games about it? There’s no forgetting the wonderful bug-fest that was Assassin’s Creed Unity, and grand strategy titles like Europa Universalis and (to a lesser extent) Empire: Total War use the Revolution as a potential setpiece. But those are all that exist off the top of my head which, to be fair, is also where I keep my YouTube Poop recommendations list. I wouldn’t trust the top of my head to hold a hat. My point is that video games need more guillotines. Luckily, We. The Revolution is here to fill the guillo-gap. Taking place smack-bang in the middle of the ‘Reign of Terror’, you play as a (fictional) judge on the (real) Revolutionary Tribunal at the turn of the 18th century. Most of the early game will be spent in that infamous courtroom, hearing out defendants and the mad circus that surrounds them. Lawyers call such pesky details ‘questioning’. You have ultimate power over your verdict, jury and (real) prosecutor notwithstanding, and the defendant’s lives are, as such, in your hands. Innocent or guilty? Prison or death? You should probably pick death, because you can do a rousing speech and pull the rope yourself. That’s not to say that the cases are ever easy. Each case is morally ambiguous, but not in the way that a game like, say, Papers, Please presents moral ambiguity. There’s never a clear ‘right’ or ‘wrong’, but each faction vying for the control of the First Republic will hint-hint you in a certain direction. So what if she’s an innocent old lady? Citizen Honhon thinks she’s a bag, so off with her head! See, the verdict of these cases will determine your favour with the various groups vying for control of France. Sentencing a commoner to death for speaking out against the Revolution will please the radicals but see your reputation amongst the average Jane and Joe plummet. These reputation ‘scores’ have an impact on the other aspects of the game; let one slip too low for too long and your head will be on the line – literally. Sometimes, your verdict will even make your family avert their gaze at the dinner table. That is, if you’re even at the dinner table. Just like Lucas Pope’s pseudo-Communist document thriller, We. The Revolution has family relations as a game mechanic. But whereas your family’s harsh lives in Arstotzka are dependent on you for survival, your judge’s Paris home is vital for yours. Each member of your family gives different buffs to reputations, and you can’t please everyone. Maintaining strong family ties is just as important as keeping up with the (radical) Joneses. And you can’t do that if you spend every night drinking and gambling with chums and comrades for (important) information and resources. Now, if this is making the game sound like Ace Attorney with (somehow) more death, hold on to your hats because this game is taking you on a field trip. We. The Revolution’s struggle for power thrusts you into all kinds of situations. Political debates, gambling dens, back alleys, and even battlefields. Oh, yes: battlefields. We. The Revolution is not content to sit on its core gameplay loop and call it a day. There’s always a new mechanic being triumphantly unveiled to wow its players, from a board game-styled map screen where your allies do your bidding, to a turn-based combat scene. This game never has a dull moment, but that’s not just down to the variety in gameplay. A huge part of what makes We. The Revolution so engrossing is just how well it brings out the mood of the Reign of Terror. You always feel constrained by something, whether it’s the latest political intrigue or a threat from a baron’s henchman. There’s always a threat lurking in the shadows, waiting to strike. That lingering sense of danger is what makes We. The Revolution such a good political thriller. 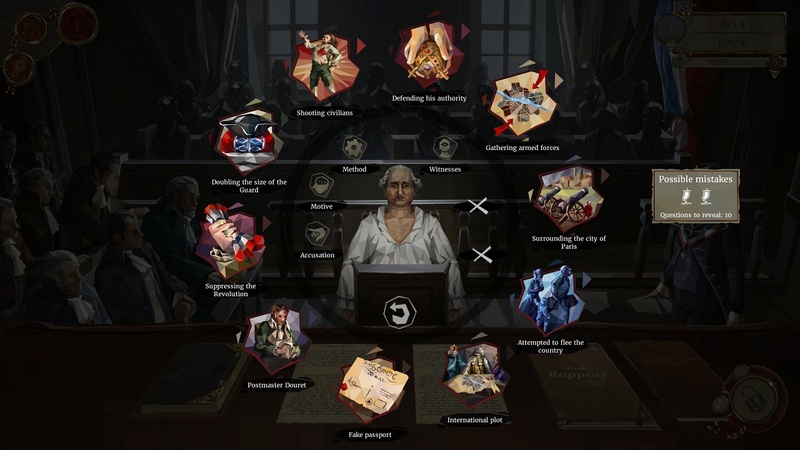 That’s without getting into its diplomacy; at various points in the game — including the aforementioned public executions — you’ll have a chance to open up an ‘argument wheel’. Reading the audience, a roaring crowd or an attentive politician, you choose the right kind of thing to say to get them to take your side. This mechanic was my favourite part of the game; getting a read on somebody’s personality and getting them to see your side of the sandwich…er, baguette, was always rewarding and played heavily into the political aspect of the game (more on that soon). While the story can get ham-fisted in places and downright predictable in others — I managed to call a big story shock as soon as I saw its victim’s role in the game — there’s no denying that it was easy for me to get stuck into the atmosphere. 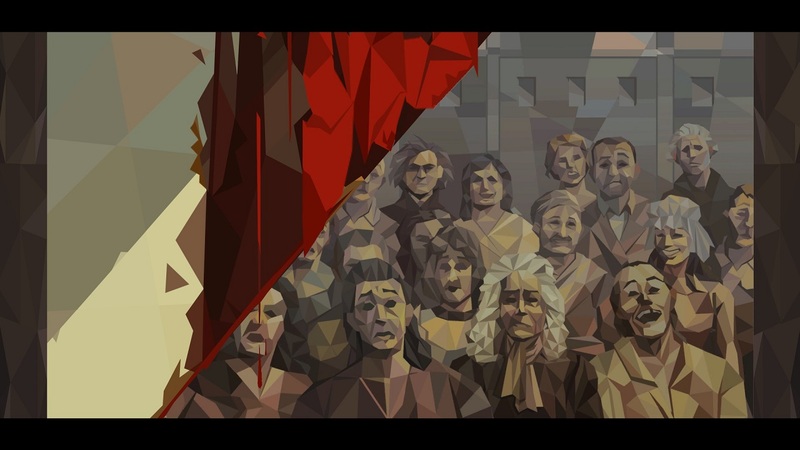 My (admittedly basic) knowledge of the Revolution’s historical background took me out of it as the game veers toward narrative over accuracy in its latter half, but presentation was top-notch for the most part. The voice acting could have been better, though. In fact, We. The Revolution may have been too ambitious. The variety in gameplay is great, but a lot of it feels unrealised. Perhaps, in lieu of a higher budget, a reigning in of features would have allowed greater utilisation of a smaller number. Then again, it says something about the well-oiled machine the game is when I can’t name a single thing I’d remove while keeping the experience tight. Hang on, how can I not mention the art style? 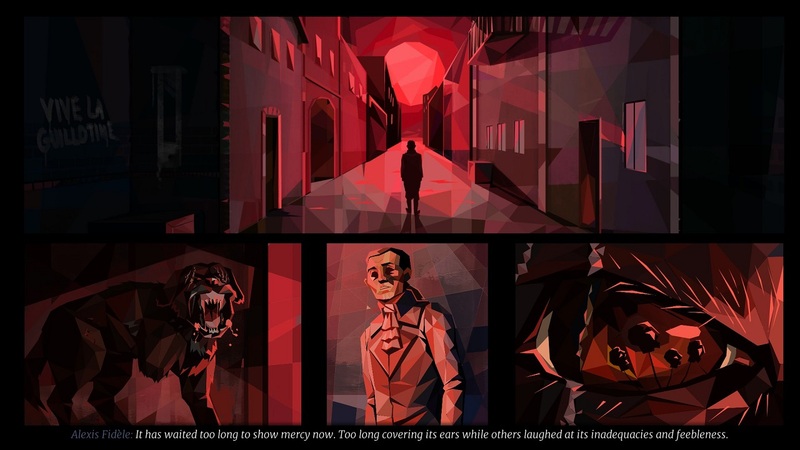 It’s a mixture of period-accurate stylings with a polygonal touch and makes We. The Revolution an instantly recognisable game. Cutscenes make full use of this, seamlessly blending profile panels with wide shots and even full-screen landscapes. It’s all presented with such confidence and grace that the voice acting never quite ruins it. The soundtrack was fine when it was there, but it’s nothing all that special. What is special, though, is the game’s handling of its historical source material. The French Revolution’s nature and moral righteousness remain hotly debated amongst historians, and it’s still a controversial topic in the dining rooms and bars of France. The politics of the time were such hot takes that they still light fires in hearts today all over the world. It’s a relief, then, to see We. The Revolution handle it with a bipartisan grace. It’s brutal, it’s unforgiving, and it doesn’t pull punches…but that’s what good history always is. History is never unbiased, history is always political, and We. The Revolution portrays the French Revolution as it actually was; the closest to ‘organised chaos’ we as a species have ever been. The Aristocracy are shown to be bastards, sure, but they’ve given some damn good arguments for restoring the old order. The mad Jacobins abuse their power however they can, but their revolutionary propaganda reminds us of why it actually happened in the first place. As for the common folk, they just want what they always have; a safe house and a warm meal. And, in the end, the Revolution is laid bare as the fragile non-peace it actually was. We. The Revolution is up there as one of the most unique experiences of the year. While its scope may turn off people looking for a more focused game, you simply couldn’t ask for a better representation of the time period — even when it strays from what the books say for the sake of a consistent narrative. If you’re after a political thriller that’s actually a goddamn political thriller, then We. The Revolution is your best bet.